Last Sunday was the BAFTA Children’s Awards and the stars were out in force. The red carpet event at the London Hilton, Park Lane saw stars such as Myleene Klass, Henry Winkler (The Fonz), Pussycat Doll Ashley Roberts, Aimee Kelly, Bobby Lockwood and Natalie Gumede attend. However, there were some even more special attendees at the awards that night. 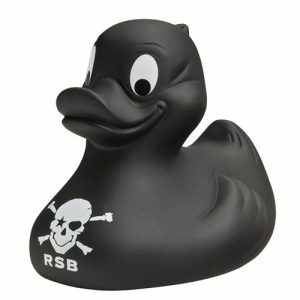 A gang of Rock Star Baby’s black rubber ducks managed to slip themselves into every goody bag for the guests to take away with them. The rebels.